The scale length is the distance from nut to bridge. Banjo scale length varies depending on the instrument. Many resonator banjos feature a longer scale length. The scale length is the length of the string from the nut to the bridge. 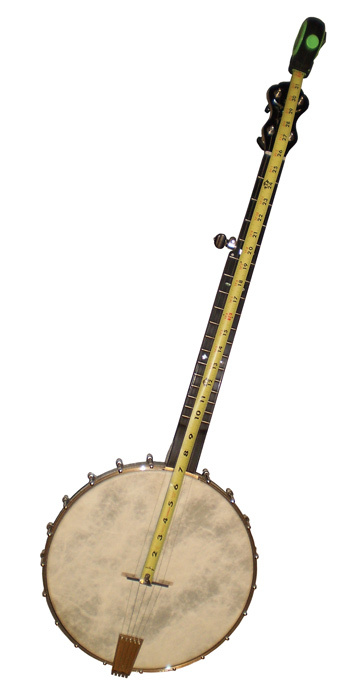 Some old-time or open back banjos feature a shorter scale length. Generally, a longer scale length means a longer neck and a greater distance between each fret. A variety of tunings are employed in open back banjo playing. The most popular tunings in my area are A, D, G, and C. The banjo scale length should accommodate for this facet of the instrument’s intended use. I like a banjo scale length of 25.5″. It is the same scale length as many popular guitars. It is a scale length that allows for tuning up to the higher keys of A and D without a significant risk of string breakage, but is long enough for the lower keys like G and C to sound good without the strings being too loose. The relationship between the length of the string, the diameter of the string, the weight of the string, and the tension needed to bring the string up to pitch are of interest to the builder of any kind of string instrument. The longer a string is, the heavier it will be. String weight also increases as diameter increases. The total weight of a string is calculated by first determining the weight of the string per unit of length, then multiplying the total scale length by the weight per unit. String weight per unit length is determined by a variety of factors such as the diameter of the string and the materials the string is made from. Greater tension is required to bring a heavier string up to pitch. A string under more tension produces vibrations of greater amplitude and results in greater volume. Heavier strings are sometimes used on short scale instruments. Light gauge strings may feel floppy on a short scale instrument. Why? Think about it, the shorter the scale length, the less the total weight of the string will be. A string of lighter weight requires less tension to bring it up to pitch. Lower tension typically results in vibrations of lower amplitude and less volume. Many other factors play into the volume that an instrument is able to produce. It may take some experimentation to find the perfect string for an instrument of a particular scale length. Click on over to Wikipedia for more on scale length.